Sissel Morken Gullord (1974) is a Norwegian musician, singer and artist. She lives in Biri with a view to the lake Mjøsa. She is known as a passionate player of the Norwegian bukkehorn and was headhunted to play in Disney’s “Frozen”. She plays in “Lilyhammer” and recorded some tunes together with Steven Van Zandt, who wanted “the amazing norwegian horn” to be heard in the Netflix TVseries. Sissel is representing “Norway” in the turn-based strategy-game Civilization VI with her music. Sissel was awarded the Government work grant for three years from the Art Council Norway in 2015. She plays the french horn, the bukkehorn, the wooden lur, the baroque horn and the classical natural horn. She sings traditional music, jazz, pop, rock, – she loves music and doesn’t want to limit herself to one kind of style- she wants to play with them all! She has released some songs on her own record label, besides some bukkehornplaying on “Norwegian Bukkehorn”. Everything is available on iTunes, Spotify, Tidal etc. Sissel has reached a huge audience worldwide with her TEDxtalk “A Frozen magical journey from the Norwegian mountains”. She has won the National competion in traditional music; Landskappleiken, later been a judge in the same competion, had the honour of playing and singing for the King and the Queen of Norway, the Crownprince and the Crownprincess at the Parliament in Norway when the King and the Queen received their anniversary-gift from the Parliament’s President. She holds a Master’s degree of Music Performance from the Norwegian Academy of Music, where she studied with professor Frøydis Ree Wekre. 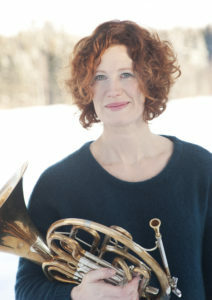 As a natural horn player, she has played with Concerto Copenhagen, Helsinki Baroque Orchestra, Drottningholm Court Theatre Orchestra, Swedish Baroque Orchestra, Wasaorkestern, Barockorkestern Stockholm, Corona Artis etc., and has recorded with Barokkanerne and Oslo Kammerakademi.